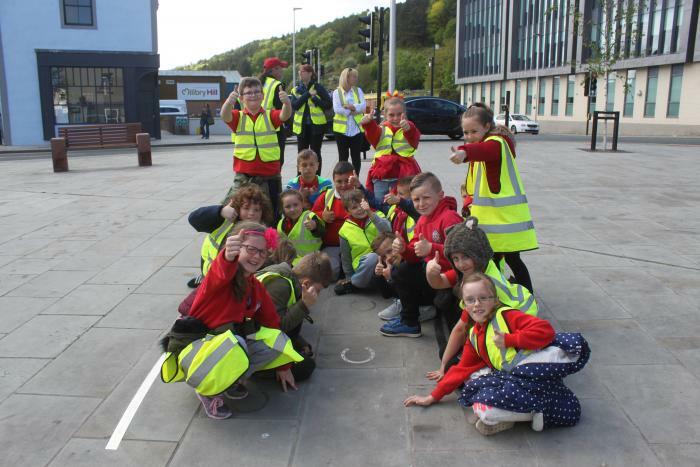 BRINGING Whitehaven’s rich history to life were a group of local schoolchildren who enjoyed a trail through town yesterday (Thursday, May 18). The Henisngham Primary School pupils were led from The Beacon Museum into the town whilst learning of historic events such as the Wellington and William Pit disasters, alongside the harbour invasion at the hands of legendary naval commander and suspected pirate - John-Paul Jones. This is the 24th school group to have enjoyed the town trail which is currently funded by the Whitehaven Townscape Heritage Initiative which subsidises travel costs for local schools as part of its remit to bring history alive for young Copeland residents. The Beacon Museum learning officer, Alan Gillon who leads the town trails, said: “Bringing pupils out of the classroom enables them to learn all about the rich and diverse local history in a live environment. The children were delighted to learn about the history of some of the buildings in the Old Town area and how a horse drawn waggon way, carrying iron ore, ran through the Market Place to the harbour. They were also interested to find out that Pow Beck once ran openly down James Street and Market Place to the sea, and although now covered, it still runs under the pavement below their feet. Year 3 teacher, Julie Wilson, said: “It’s a valuable resource for local schools that’s right on our doorstep. The Whitehaven Townscape Heritage Initiative launched in October 2013 and runs until December 2018 and has so far invested nearly one million pounds in Whitehaven town centre, transforming buildings including the recently refurbished Whitehaven Foyer, two vacant properties on Market Place and James Street and the Little Hong Kong takeaway. The Townscape Heritage Initiative is a partnership led by Copeland Council that receives funding from Heritage Lottery Fund, Copeland Borough Council, Britain’s Energy Coast and Cumbria County Council. Julie Betteridge, Director of Customers and Communities at Copeland Borough Council, said: “The partnerships between The Beacon Museum and The Whitehaven Townscape Heritage Initiative is a fantastic example of how we are investing in our local town and residents. “Many don’t realise the vast amount of knowledge and artefacts that we have on the way things were dating right back to 310 million years ago.